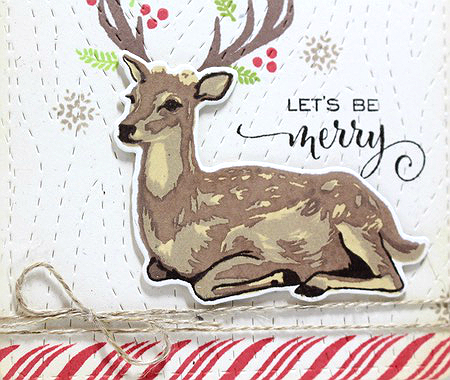 It's no secret that this stag is one of my favorite images in the SOA Candy Cane Lane collection! I love dressing up those antlers!! We have a limited number of boxes left, make sure you grab one before they are gone! Candy Cane Lane is only available while supplies last! I have one more card for you using Candy Cane Lane & the Peppermint Stick Background stamp. I had a blast making my own patterned paper here. I actually had this idea in my head from the moment I saw this background stamp. I stamped the Peppermint Stick Background three times, once in Pure Poppy ink, once in New Leaf and once in Hawaiian Shores. Next I cut each into 1/2 inch pieces. On a piece of computer paper, I adhered each of the pieces, making sure to line up the pattern. This is a super fun way to use large background stamps! Seriously, this collection is a must have! I probably say it every release, but this one is my favorite. I have so many ideas for it too. 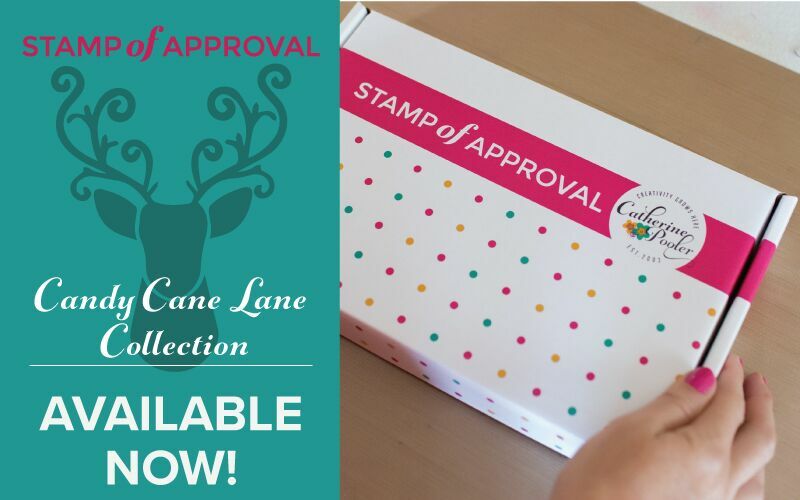 Welcome to Day Three of the Stamp of Approval Cane Cane Lane Blog Hops. Today myself and some of my favorite designers are sharing cards using the Stamp of Approval Candy Cane Lane Collection! The Stamp of Approval is an exclusive collection of stamps, dies and accessories hand picked by Catherine Pooler. I've been sharing some projects for the past few days, so be sure to check those out HERE and HERE. Today I'm sharing two cards, both rustic Christmas, my favorite to make! I don't usually gush over my own cards, but this one...THIS is what Christmas cards should look like. I definitely favor traditional color combinations for my holiday cards and anything with a rustic flair! This card was also easy to make and if I decide to mass produce some cards this year, this will be it! 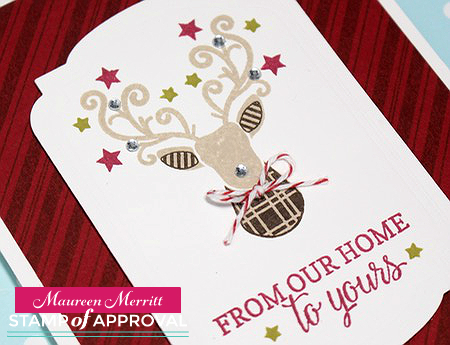 Just stamp the card base with the Merry & Bright boughs, Then stamp and die cut the stag and bird from Hip Holiday. Die cut the Merry Labels die, sponge and assemble. My next card uses the same basic idea of randomly stamping images, but this time I did it on a panel and used more of the images from Merry & Bright Boughs. This is another super simple card to mass produce. I started with a 4 x 5 1/4" piece of Oatmeal cardstock. Then I stamped the top of the panel with a variety of images from Merry & Bright Boughs and Hip Holiday. There are so many fun little accents hidden in these sets, they make background stamping and embellishing a blast! The "Merry Christmas" sentiment from Hip Holiday is definitely going to be my go-to for my holiday cards, inside & out. To finish this card, I tied the top with Linen Thread and added the stamped panel to a Cherry Cobbler card base. That's it from me today! It's time to start hopping along. My card today features something from just about every set in the Candy Cane Lane collection. 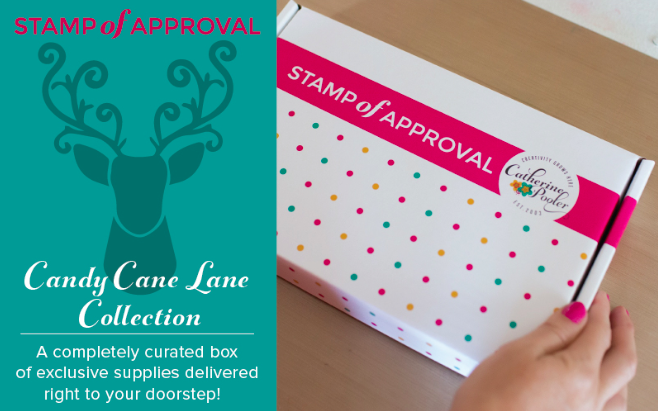 I always love how the products in each Stamp of Approval box work so well together, so you can make many cohesive designs with them. This card came together using a bunch of leftovers from other projects, I love when that happens! All I did was stamp the sentiment from Merry & Bright Bright Boughs, stamp and die cut a few of the peppermint candies from Candy Cane Lane, assemble this and that and this card was done! I hope you've been enjoying the blog hops this week. Head over to Catherine's blog so you can join in today's blog hop! We are giving away a box each day, so you will definitely want to leave comments. The more comments you leave, the more chances you have to win! See you tomorrow for Day 3 of the Candy Cane Lane blog hops! (to the Waitlist) & the 22nd to the general public! 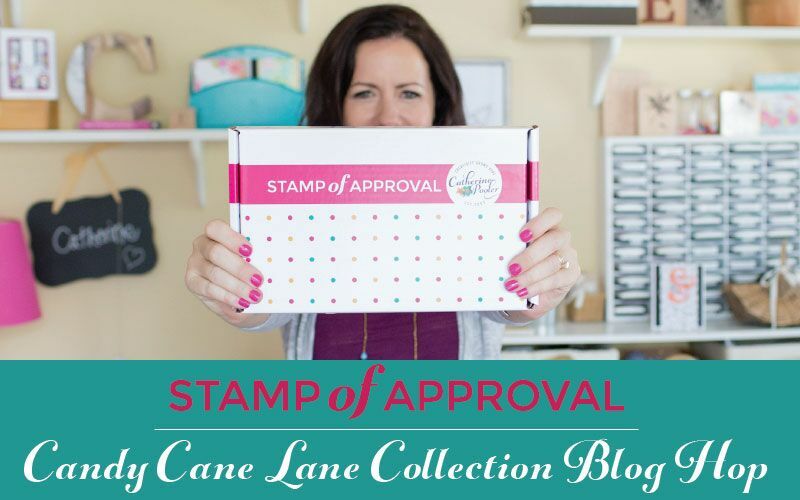 If you haven't heard of the Stamp of Approval yet, you may be wondering what it is all about. 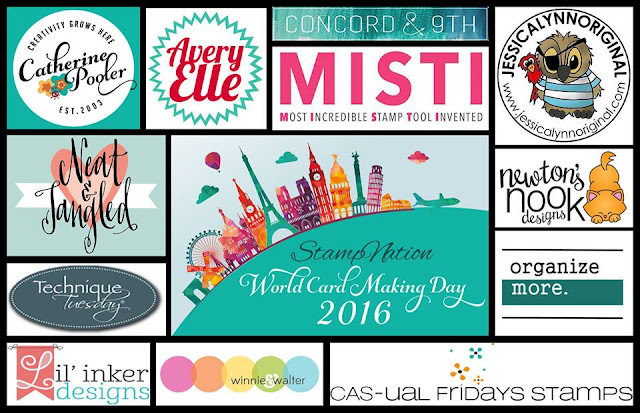 My friend Catherine Pooler has been working with top companies in the stamp industry (CAS-ual Fridays, SugarPea Designs & Neat & Tangled etc) to develop an exclusive collection of versatile stamps and supplies that will work together or separately to create many unique cards. Along with the products in the box, you also receive a Project Guide giving you step-by-step instructions on how to create many, many cards using the collection. 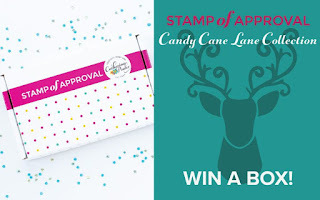 My card today features the Candy Cane Lane & the Peppermint Stick Background stamp sets. How cute are these candy canes? I'm so in love with them. Actually, a while back when we started planning for the SOA holiday collection, I came up with the concept of patterned candy canes. It has been an amazing process seeing that idea come to life. While I usually gravitate toward traditional color combinations for Christmas, I decided to go with something a little different on this card. The clean and graphic layout and black accents really make this design pop. Head on over to Catherine's blog where you can participate in the blog hop. A box is being given away each day, so make sure you leave comments along the way. I'll be back tomorrow with another card using the SOA Candy Candy Lane collection. We have a new color challenge up at StampNation that made the whole team start on their holiday card making! How awesome is this stamp set?!?! I'd love to have you join in our challenge, BUT you have to be a member to play along!